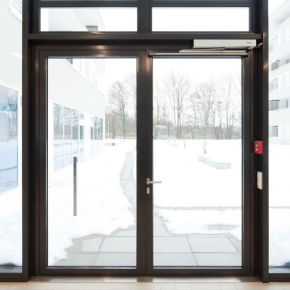 With experts warning that we’re about to experience out “worst winter in 70 years”, GEZE UK is encouraging carrying out weekly checks on automatic doors. GEZE UK’s service director Steve Marshall says that ensuring doors are properly maintained and working correctly is vital during bad weather. Doors will help reduce heat loss, reduce the chances of water ingress – minimising the chance of slips or trips – and reduce carbon footprint and C02 levels into the building. Steve advises estate and facilities managers to put in place weekly checks to ensure that doors open and close with maximum efficiency. “If the doors form a secure entrance proper maintenance is essential to ensure that the door leaf or leaves close fully on to locks or magnetic locks to maintain security,” Steve explains. In addition, ‘dutyholders’ need to prepare for snowy and icy conditions and minimise risk. The HSE’s Approved Code of Practice (ACoP) L24 for the Workplace (Health, Safety and Welfare) Regulations notes in paragraph 96 that this might include “gritting, snow clearing and closing off some routes, particularly outside stairs, ladders and walkways on the roof”. Carrying out risk assessments before the bad weather arrives is the best course of action, it recommends.